Who doesn’t love an easy, healthy turkey chili recipe? This hearty paleo turkey chili recipe has all the flavor but fewer carbs than your typical bean chilis. I kept the beans out so I could save my carb intake for other foods but you can easily add them back in if you’re not following a strict paleo diet. The red bell pepper and onion still give the chili plenty of fullness. The best part about chili? It makes great leftovers and also freezes well. I cooked this paleo turkey chili in my instant pot but it could also easily be done on the stove. Make large batches for your family by doubling or tripling the recipe. 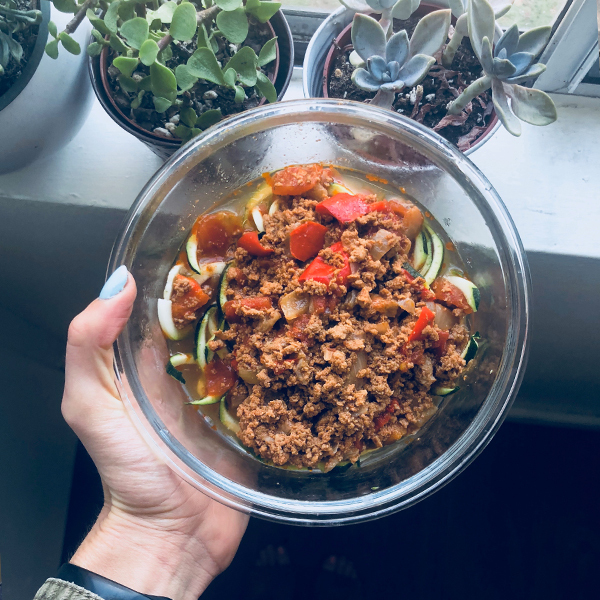 Serve over zucchini pasta from a delicious combo your body will thank you for. Another fun sub you could also try is to use grass-fed ground beef or bison instead of turkey! I know that combination would also be delicious. Add the ground turkey, tomato paste, and seasoning (chili powder, oregano, cumin). Cook until turkey is brown. Hit the off button on the pressure cooker (instant pot), put the lid on and hit the chili button. Finally, press chili and set to 15 minutes. Let the pressure cooker (instant pot) depressurize naturally. Set aside in bowls. *If you don’t have a pressure cooker (instant pot), you can follow the same instructions on the stove. The only difference is at the end you’ll bring the ingredients to a boil and then reduce to a simmer for 45 minutes. Need another winter recipe? Check out my pressure cooker chicken soup.